All of the benefits of Clippard quality and reliability are available in these 10 mm and 15 mm valves. 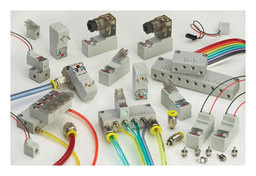 Offered in both Normally-Open or Normally-Closed models, these 2-way and 3-way valves are perfect for small areas where compact electronically-controlled pneumatics are needed. This series has a high strength, engineered light-weight glass filled nylon body, along with stainless steel, FKM and Nitrile, making it suitable for a broad range of applications. With exceptional life and reliability, this is the perfect sub-miniature valve for tomorrow's needs in a wide variety of industries. Electrical: The coil is constructed of copper wire and is insulated according to the class "F" standard. All circuitry and connections are protected from corrosion.